G.W. Pabst's first sound film, Westfront 1918, carries the same message that Lewis Milestone's legendary film All Quiet on the Western Front does: war is madness. 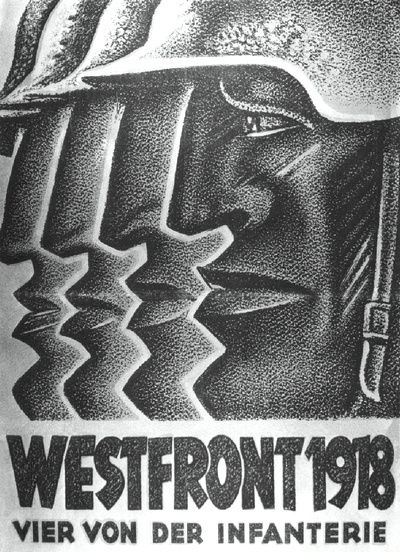 At its Berlin premiere on May 23, 1930, some moviegoers supposedly found Westfront 1918's realism so shocking that they fainted in their seats. The bulk of Pabst's film has the raw appearance of a documentary feature. As World War I intensifies, the camera looks in all sorts of different directions to capture the chaos and blood-curdling carnage that people have been forced to endure. Sometimes the intensity of the random fights is so overwhelming that it almost looks as if the soldiers on both sides of the barb-wired trenches are lunatics who have somehow managed to get away from a mental institution. The breaks between the fights are just as random and borderline surreal. Early into the film a group of German soldiers gather in an old cabaret to enjoy an improvised play by two aging comedians who have been tasked to temporarily make them forget the madness. Their play is poor, but with death lurking around the corner it feels brilliant and the spectators are thankful to be able to hear a few genuine laughs again. Then, just as abruptly, the soldiers are sent back to the front and the fighting resumes.